1. Both require a long term commitment. 2. Both bring tremendous joy and pain. 3. You really have to work at both of them. 4. You have to show up for both. 5. Over the long term, both can bring great benefit to your health. It’s now summer, and as I look back at my decades-long running program, I realize that my most successful years were those where I built my base in the summer. Several years I did very little during the summer, and then when cross country started in September, I was pretty much out of shape. I then over-trained, trying to get ready for racing. When I was younger, I could get away with it most years, but not always. Sometimes it was my Achilles heel, or my knees, or even the occasional hamstring. As I aged, the injuries occurred more often and took longer to heal. When I did train in the summers and had the more successful years, I focused on distance training, with only occasional speed work. This is what New Zealand coach Arthur Lydiard suggested in his book, Running Training Schedules. During this period Lydiard would say, train, don’t strain. Now I look at the 3 month summer as a bridge of easy running between 9 months of more stressful training. But easy doesn’t mean take it off; it means take it easy. It is a time to rebuild your strength. For this week’s training schedule, on the interval day, I ran just 2x 200 meter repeats at faster than race pace, with a 4:00 walking rest between. The next day I ran the regular 1 mile warm up and 1 mile warm down, with an easy 1 mile steady run in the middle. I rested the next day, and the following day I did 1 x 5 minute tempo run, with the regular warm up, stretching and fast strides, and warm down. With the two days, one easy and one rest, between the intervals and tempo days, this gave me one more day between the two harder workouts than I had been taking in previous weeks. I felt much better on the tempo day with that extra day. I’ll see how I feel next week. So far this summer I have been training over shorter distances and doing fewer repeats because of my long layoff and sore knees. My knees are pretty good now and I’m beginning to feel stronger, so I probably will begin to add mileage. I’ll try to remember the rule of thumb to add no more than 10% every two weeks! High School – New York State Cross Country Champion and Eastern States 1 Mile Champion. College –Personal Best times of 1:51.1 in the ½ mile and 4:13.2 in the mile. 2012 USATF National 800 Meters Masters Championship – 4th Place. 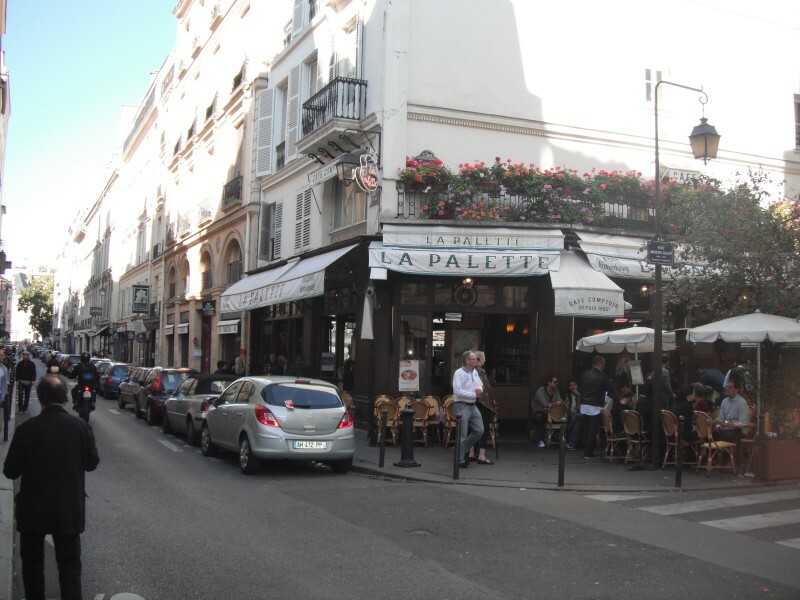 I’ve had periods of long layoffs, major weight gain, and dissolute living (a bit of it at La Palette on the Paris Left Bank in the photo above), but I keep coming back to the sport I love. You will probably have your “downs” as well, but the more times you come back, the longer you will stay with it each time. Please be with me again next week for another insight or two. I’ll muse also about moderation.